Lauren Spalding currently attends St. Margaret’s Episcopal School in San Juan Capistrano. Ever since Lauren was a child, she had a dream of going into the field of medicine. She interned at the Medical Intelligence and Innovation Institute (MI3) at Children’s Hospital Orange County (CHOC) in 2017. While at the hospital one day she witnessed a well-intentioned family friend bring a large gift for a sick child, while the sick child’s little brother sat observing in the wings with a polite but “what-about-me” look on his face. Lauren, recognizing the impact that a critical health condition has on the entire family, was determined to recognize that sibling, and many more, in some small way. Lauren held a “Sib Sack” toy drive at her church’s Vacation Bible School that summer and collected enough toys to deliver over 200 Sib Sacks to CHOC and Rady Children’s Hospital in San Diego, CA. 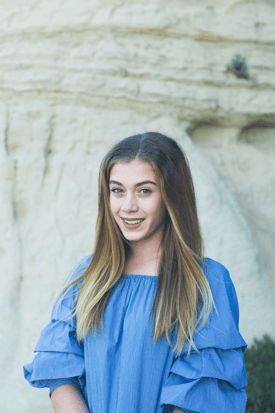 Since 2017, Lauren has held four toy drives through her school, community and church and has delivered over 500 Sib Sacks to Southern California area children’s hospitals. Additionally, with the help of friends in other states, Lauren has been able to expand her reach by providing empty Sib Sack’s to organizations so that they may host their own toy drive and deliver to local area children’s hospitals.